2 v 2 Tournament | Birmingham Hardcourt Bike Polo, UK. Starting at 10am (prompt! ), we’re expecting 6-7 teams to battle it out over a round-robin format. The idea is to put a bit more emphasis on playing to win, building partnerships between players and letting us experiment with the nuts and bolts of running a tournament. Throw-ins are great, and mini-tournaments like this won’t become the norm, but it’s nice to mix things up a bit. If you’re in Brum, Coventry or somewhere else nearby and want to play, add your name to the list (http://www.lfgss.com/thread62493.html). We’re going to take show of hands on how we choose teams – either random, or use seeding to make theoretically even teams. This is a good chance for everyone to show their game-winning skills before we do seeding the following week, but we’re hoping the atmosphere will remain relaxed; bring spectators, beers, food and heckles. 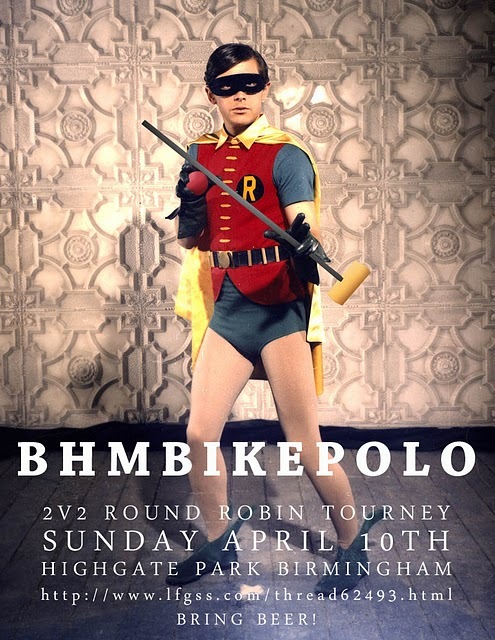 This entry was posted in Birmingham Bike Polo and tagged 2 v 2, bicycle polo, bike polo, birmingham bicycle polo, birmingham bike polo, birmingham bike polo team, birmingham polo, Cambridge Polo Tournament, heckle, round robin, Seeding, tournament. Bookmark the permalink.